Lexys, did you backtest this system manually, taking into consideration new releases? I just finished backtesting it throughout May and June using tradingview.com’s charting software and that took me bloody 4 hours, I can’t imagine how long would it take to backtest years worth of trades. And I wasn’t very picky about my exits, just used the close price of 15 minutes candles. 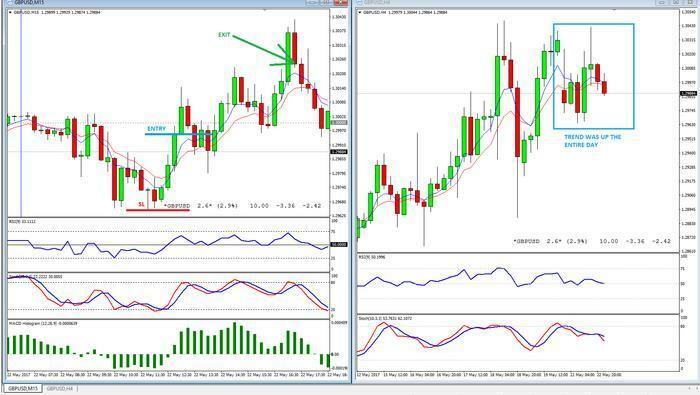 The results are +60 pips (21 trades) in June, and about +300 pips (20 trades) in May. Spread not included. Of course 40 trades are too little to draw any real conclusions, but at least it gives me some hope that this system might not be a total bogus. Also as Michael already mentioned using proper MACD is vital, I was really surprised to see how many times it did prevent me from taking a loosing trade. No; I backtested it using automated software and over 10 years of data. The other two people I mentioned did the same (in their case, using privately owned software which belongs to their financial-institution employer). Hmm are you sure the EA was working properly giving the exact same results as you were to trade it manually? Sorry I don’t want to come of as rude by questioning your and others’ experts programming skills, but I just saw many failed attempts to automate this system. Where I can get the updated Cawabunga System? I just want to try if it works for me. Thanks in advance. It’s an interesting trade system, but I think it’s quite complicated, too many variables, I believe the simpler the trading system, the more effective it is. How do I get the system and the rules to know if it matches my trading style. It’s one of the simpler ones I’ve seen. Takes 10 secs to set up on charts, wait for MA crossover, check 3 indicators and decide. Not complex at all.